Adam Grant almost invented Facebook. After being accepted to Harvard, he looked for a way to connect with his future classmates. He searched AOL, found a couple of incoming freshmen, and created an email list to help them connect. By the time he arrived at school, he was acquainted with more than 100 classmates. Boom: Harvard’s first social network. Now that he knew everyone face to face, he shut the service down. “And then Mark Zuckerberg started Facebook in the house next door five years later,” he says with a chuckle that’s punctuated by about 10 zeroes. Grant instead went on to study organizational psychology, write three New York Times best sellers, and teach as a professor at the Wharton School. While he’s quick to admit that he never had the vision or technical know-how to turn his social network into anything resembling Facebook, he knows a wasted opportunity when he sees one. 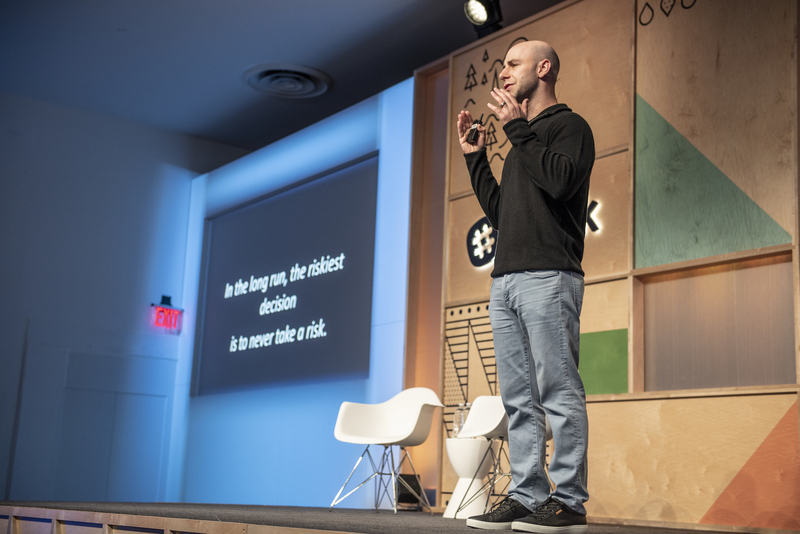 “We sit on ideas that have real potential, but we don’t pursue them,” he says during Slack’s Frontiers conference in New York City. Thankfully, Grant’s idea wasn’t a total waste. He now has a treasure trove of advice about taking risks—and heeding this advice may help us seize our next multibillion-dollar idea. Once you find a great idea, act on that one, and not other ones. It sounds too simple, right? Unfortunately, there’s a catch. We’re just not very good at judging our own ideas. Grant points to a study in which a circus troupe evaluated its own performances. When the performers ranked their own acts, they almost always ranked them too high. This isn’t a trend restricted to trapeze artists and lion tamers, either. While Grant too easily overlooked a multibillion-dollar concept, most of us struggle from the same tendency as the circus performers. We have a blind spot that can make us overestimate the value of our ideas, the clarity of our words, and the execution of our actions. Managers, on the other hand, have the opposite problem. During the circus study, the performers’ managers also ranked the acts. “It’s their job to decide which ideas live and which ideas don’t,” Grant says. You might expect them to get this right—but they downranked performances that were too different or novel. “Managers have templates in their heads about what a successful idea looks like, and those templates are built up over years of experience,” says Grant. “They take what’s worked before, they compare new ideas to it, and the more different [the new ideas] are, the more likely they are to reject them.” That template might help you survive the corporate landscape, but it’s never going to help you make something completely new. So what can the rest of us learn from the circus? Well, next time you’re writing a big story, redesigning your website, or even pitching to the sales department, try collecting feedback from at least one other creative peer in the office (and then listening to the advice, of course). Sure, that’s helpful, but how can we know if our own ideas are any good? “I think most of the time we don’t,” Grant says. But all is not lost. He has a simple tip to help you choose the ideas with merit. Adam Grant was a keynote speaker at our 2018 Frontiers conference in New York City. To get more insight into the future of teamwork, join us in London on November 13 and 14 for our final Frontiers stop. Nic Vargus thought Adam Grant was talking about the board game this whole time.